HMV has announced that its latest app will allow MP3 downloads through iOS – the first to do this since, well, iTunes. According to Gizmodo UK, which has already had some time with the app, HMV has managed to break through Apple's famously walled garden to offer up a native app experience for downloads, with no sending users to the web or getting them to jump through other hoops. As with many a music service, HMV app's backend is powered by 7 Digital and downloads will be MP3 flavoured at 320Kbps. The app also seems to be a bit of a Shazam contender as well with its ability to recognise snippets of music (courtesy of Soundhound integration) and you can take a picture of an album sleeve and get the download of that album wherever you are. Speaking about the app, Paul McGowan, chairman of HMV, said: "HMV's position at the heart of entertainment retail demands that we enable customers to buy their music from HMV in the way that best suits them and to engage more closely with the music, video and gaming worlds." HMV has had a rough time of it of late, going into administration and closing half of its stores. But it is fighting back, with a new focus on actually selling music and not pesky tech products and the new app is part of this. 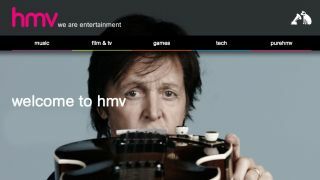 The HMV app is set to be launched next week, alongside a refreshed website and digital music store. It will be available for iOS and Android. Windows Phone and BlackBerry users will have to use a HTML5 optimised version of the site.